Just one day into the new year and I can already say I’ve been to a place on my 2010 wish list! Maialino! I truly can’t believe it took me so long to get here as it is. Danny Meyer is an absolute genius in my book. I have had some of the best meals of my life at his restaurants and luckily they are almost all within blocks of where I live. Actually with the opening of Maialino it is now the closet one to me! So on Saturday, with the blustery frigid winds blowing, Mr. T and I took a quick two block walk down to the Gramercy Park hotel to see if we could score a seat at the new Danny Meyer resto.Reservations for this place have been impossible to get since it opened but I figured we could just get a seat at the bar. It was only 6:00. Who in NYC eats at 6:00? Well apparently at hot new places a lot of people do! All of the bar stools were full! I couldn’t believe it. Luckily there was one last table in the bar area open and we were able to get a seat. The last time I was inside this place it was the Asian restaurant Wakiya. Well they did a ton of renovation since then and I have to say the place looks spectacular. Gone are the black minimalist decorations and instead beautiful wooden tables, warm white walls and bottles upon bottles of wine give this place the perfect homey feeling for a big bowl of pasta. I truly felt like I was back inside an Italian trattoria. They had a surprisingly good amount of wines by the bottle for right around $40 which was nice. 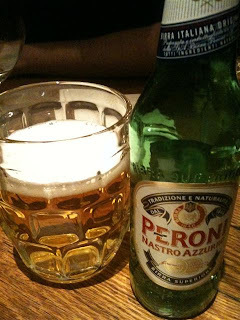 However we were both in a beer mood that night so I started off with a Peroni instead. I absolutely love this type of glassware for my beer. It casual but upscale- a perfect fit for the vibe throughout the restaurant. 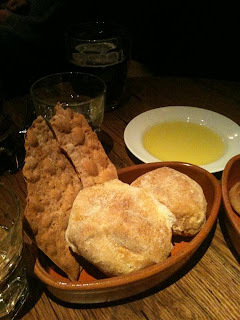 To begin our meal they brought out a nice basket of flatbread and rolls with olive oil. 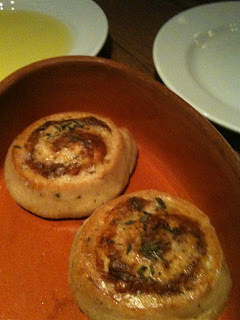 The olive oil was extremely tasty but I didn’t really care for the rolls. They were a little too chewy for my tastes. Luckily we had ordered another carb option with our meal the Panella alla Gricia. These little rolls came out looking like cinnamon buns but instead of sugar, they were rubbed with bacon and filled with pecorino cheese and rosemary. Crispy on the outside, warm and buttery on the inside- for $1.50 these rolls were a steal! Next up were ordered the Suppli al Telefono. I had just happened to read Alan Richman’s review of Maialino’s bar menu and this was one of the things he raved about and for good reason. 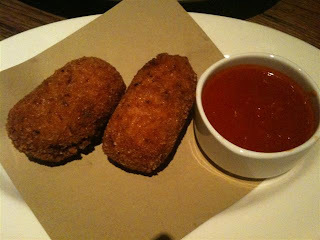 These little croquettes were piping hot and bursting with flavor. 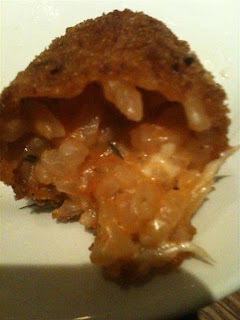 The inside was chock full of tomato risotto and gooey mozzarella cheese. No more mozzarella sticks for me! I want these guys. There was so much tomato on the inside there was really no need for the sauce but it was so damn tasty I couldn’t resist dipping in each and every bite. 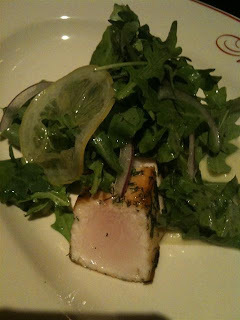 Since that dish fared so well we decided to try out another one that Alan Richman raved about the Swordfish Belly. OMG I think Alan Richman may be my new favorite food writer!! This was absolutely amazing. I have never had swordfish like this before. It was almost like a piece of sashimi in texture but slightly more firm with a beautiful lining of fat that made this taste absolutely luxurious. The meyer lemon and sunchoke puree was the perfect match for this delicious fish. I could come back here and have these two dishes each and every time and be beyond content. At this point we were debating on whether or not to order more food but decided against it. Our bodies have been a little out of whack since our Resto meat fest and we were both surprisingly full after those small plates. The cost of this meal was around $30 total. Although on a normal night this would never be enough food for a full dinner it still would be very reasonable with a few more dishes. Mr. T and I are already planning a return visit where we can sit in the trattoria itself and order off the full menu for an all out splurge. I was very impressed with Maialino and can’t believe to have another great restaurant so close to home. Bring it on winter! I don’t have to go far for some great food! I had the pleasure of working for Danny at Union Square Cafe (on the line)--to this day, I still brag about it and I STILL tell people he is the best boss I ever had. Thanks for this post--now I know where I have to head when I get to town.